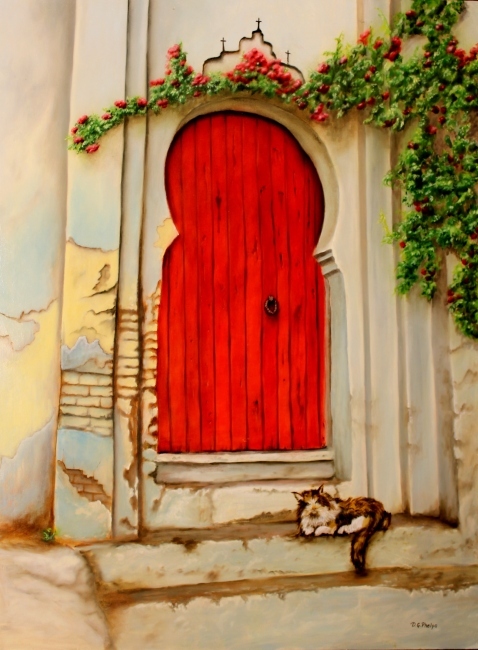 Door Art with climbing roses, and a lazy cat. 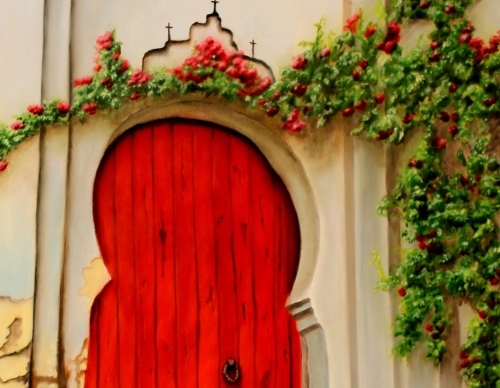 This painting is considered a cityscape, and is one of a series of red doors I have completed. 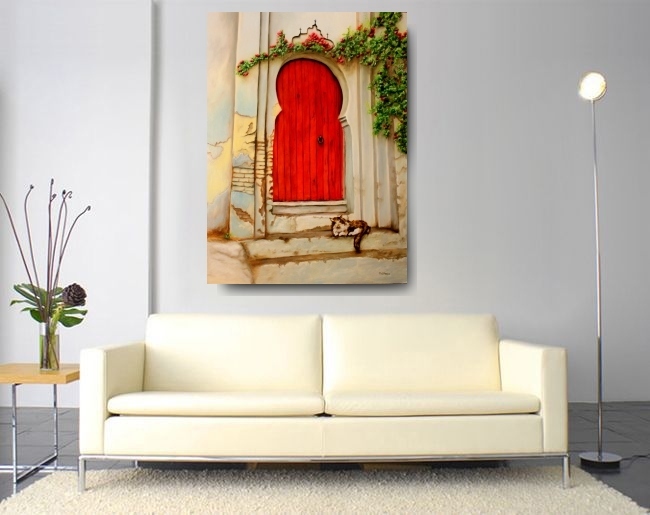 Again, this is a rare cityscape or entrance way painting that was inspired by the many wonderfully painted doors I come across. Here in the Lynchburg area we have a historic district with some really old houses, and it's a great time to ride my motorbike downtown and view the gardens and beautiful front porches which usually includes an ornamental door. I try to coincide my rides with the early morning sun or late evening sunset in order to catch the beautiful raking light across these building fronts. The blues within the stucco of this work will calm your mind, and as you imagine approaching the weathered old doorway you begin to wonder what is on the other side. The closer you get, each step, brings this wonderful aroma. Ah, you say, it's the climbing red roses. The fragrance indulges your senses as you anticipate your meeting, then you peer down to see a large calico cat welcoming you. Well, maybe not, you know cats. He is actually sitting there and swishing his tail in annoyance that you didn't bring him a sardine. Oh well. Maybe next time kitty, I bring you something too. I hope this image captivates you like your own romantic beginnings! This wonderful view of a Mediterranean entrance way and a climbing rose will surely entice your senses. It is in the vertical format so it looks well in any space. Now lets talk a little more about this painting. My wife told me, I needed something. So the cat has been added. For those cat lovers, this big calico just loves his new perch. We have a Calico, and they are a very special type of Kitty. One of the most amazing is she (females are rare) knows when someone is ill, and will cuddle up to you. This never fails to make you feel better. I know you will enjoy hanging this in your home as much as I did in creating it! See my Etsy page to get pricing, availability and shipping information! More information about my painting method and guarantee for buying art online. Just click link to see that. It opens in a new window. 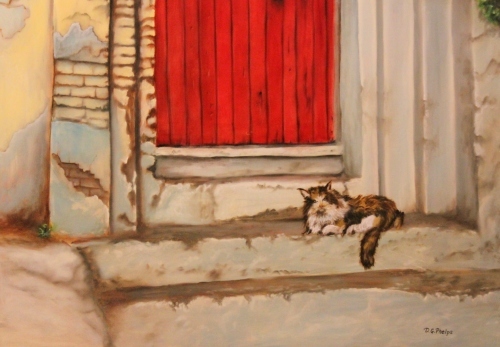 Click here to leave my door art page and head back to the gallery.